In my opinion, one of the most ‘burdened’ words is the word ‘no’. Over and over again, I keep on being amazed at how many connotations this short word brings about: guilt, fear, anger, force, despair, dejection, over-enthusiasm, and I’m most probably still forgetting some. Being a coach & consultant, I often come across it as an issue people are struggling with. Almost invariably it is labelled as ‘difficult’: ‘no’ is difficult to say, difficult to stick to, difficult to deal with. Many people are reluctant to say no to someone who is higher up on the hierarchical line because ‘that’s just not something you do’, they don’t want to hurt someone by saying no, they don’t want to be regarded as being lazy, they don’t want to miss out on an opportunity by saying no,… There seem to be many reasons to avoid the word. And there are also many reasons to use it anyway. After all, not being able to say no has noticeable consequences: it leaves you with more work than time and energy. We can’t create extra time nor energy, so we have to better arrange what we do with our available energy in the available time. If saying no appears to be so difficult, might there be an alternative? Yes indeed: Stop. Working with horses has taught me a lot about that. 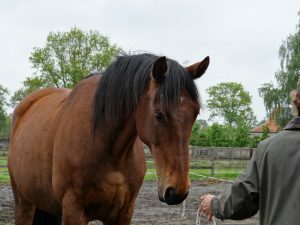 My late mentor Pieter Baalbergen made me aware of how clear horses communicate about their personal space and of how important it is in working with horses to do the same with your own personal space. He learnt me to experience that our presence doesn’t stop at our skin. If you are in the movie theatre and a complete stranger takes a seat right next to you while there are still a lot of empty places, it can make you feel very uncomfortable. Even when that person doesn’t touch you at all, he is sitting in your personal space uninvitedly, which has impact. During my training with Pieter I regularly worked with a very special mare called Vitara. We walked a pithy path, she taught me a lot. One moment she was with me in a warm and open connection, another moment I couldn’t approach her at all, and then at times she unexpectedly reared up right in front of me. Her behaviour was quite unpredictable. I was intrigued by her, and her behaviour also frightened me from time to time. She was the first horse that invited me to find an alternative for ‘no’. In fact, I noticed that a ‘no’ made her angry. I started to explore why, what message I actually gave in saying ‘no’. I realised that with my ‘no’, I labelled her behaviour as wrong without inviting her to what I wanted instead. A ‘no’ makes clear what you do not want, hence putting extra emphasis on it: what’s the first image that pops up in your mind when you are asked not to think about a rabbit?… Right. With ‘no’, I put a border around my personal space and forbade her to cross it. A border is static and a prohibition to cross it is actually an invitation to do so. Think back to the time when you were allowed to go to your first party, and your parents were very clear about the time limit: “Make sure you’ll be home by half past midnight!”. What did you do with this limit after a while? To make it broader: most wars are fought about borders… A border makes clear that something belongs to the one and something else belongs to the other, which apparently always has to be a story of or…/or… that can only be communicated about through discussion. Horses clarify a lot through clear communication about their personal space. Personal space is dynamic and attuned to what is needed in the present moment. Personal spaces are and…/and…: they can overlap. It’s not an empty idea, it is a space in which a lot of information goes to and fro: ‘What is your intention?’; ‘What is your message?’… Amongst people, too, personal space is an essential element of our communication. However, we often don’t notice the subtle signals anymore, not with ourselves, not with others. Consequence: by the time we feel that something or someone is– physically or energetically – too close, we often see setting a border as the only opportunity: “No, not closer!”. Such reaction comes across as an attack (or a flight), hence inviting to flee (or attack). For those who want to learn more about this I can strongly recommend literature on how behaviour calls for behaviour (Leary’s Rose). Do horses never set limits? They do, although actually setting limits is often a final phase. Many signals on personal space precede the act of setting limits. Noticing these signals makes a burdened ‘no’ redundant. How this works? Therefore I return to Vitara. I learnt how to make clear the message I really wanted to give. My real message was not ‘no’, my real message was ‘Stay over there, I need the space in between us to be able to take care of our safety’. I had a very clear idea of ‘there’: the moments on which I couldn’t establish contact with Vitara, ‘there’ was at a distance of at least five meters. However, it was a completely different message from ‘No, not closer’: through ‘there’, communication remained open. I didn’t try to correct her behaviour anymore. I didn’t bother anymore about the fact that she reared up, kicked and bucked ‘over there’. I also didn’t want her to go away from me anymore. I could sincerely continue to give her the message ‘We can be together with a safety distance in between us’. I thus remained in the Together-mode, hence inviting her to do the same. Back then I didn’t know anything about the behaviour model of Leary, nor about the Solution Focused approach, but looking back, Vitara is one of the horses that has made me use two basic themes that I consistently work with nowadays as a coach & consultant. To be specific: the message ‘Stay over there, I need the space in between us to be able to take care of our safety’ can be summarised in the message ‘Stop’. The stop-mindset is radically different from the no-mindset. A stop-mindset creates exploration space, keeps communication open, invites to look at what’s next together. In working with Vitara, this mindset has undeniably led to more connection, which showed in her behaviour becoming more attuned. My no-mindset made her angry and led to discussion. My stop-mindset made her curious and led to connection. And this, I notice, is also true in human communication. I’ve already seen a successful increase of connective clarity by the use of ‘Stop’: in communication from leaders to collaborators, from collaborators to leaders, amongst colleagues and also in people’s personal context.